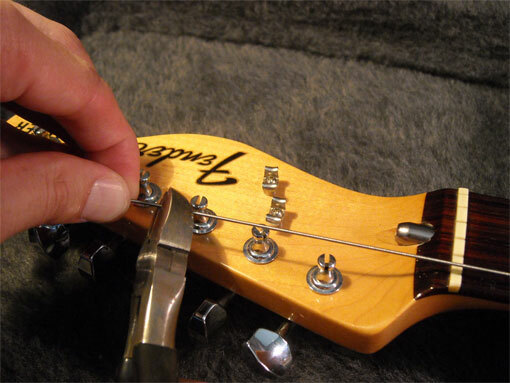 How to change the guitar strings on Fender® style guitars - including most guitars with the tuning pegs on one side of the headstock and that are strung through the body. The guitar shown is a Fender Telecaster®. 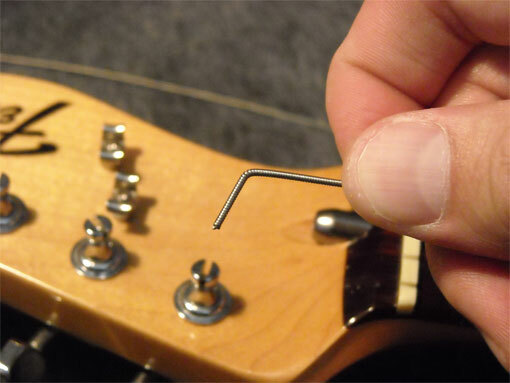 For Fender Stratocasters® and Strat® style guitars, note that the strings go through the tremolo brigde, also accessed through the back of the guitar. 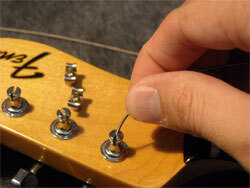 Changing a guitar's strings is probably one of the first guitar maintenance skills a guitarist learns. 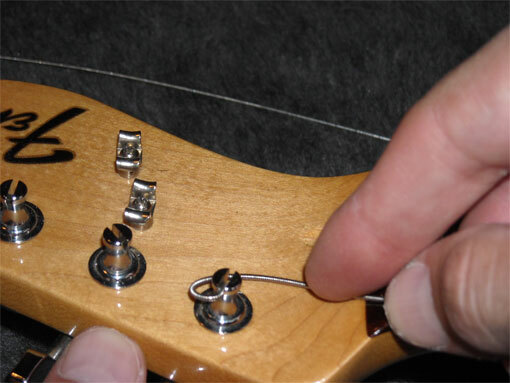 Whether you're changing the whole set or just replacing a single string, here are the basics to changing guitar strings. 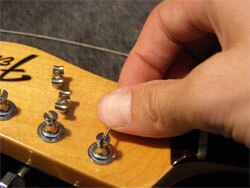 The first step in changing a guitar's strings is taking off the old strings. Loosen the tension of the old stings by winding the tuning peg until you have enough slack for each string to move them freely. 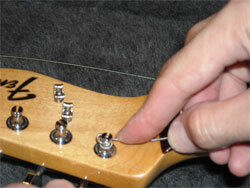 Remove the wound part of the guitar string from the tuning peg. Next, use a pair of wire cutters to cut the curled end off each string so it can be pulled through the body of the guitar easily. Once the strings are cut, feed them through the guitar's ferrules (the holes in the back of the guitar) or through the tremolo bridge if you have a Fender Strat® style guitar or a guitar that uses a tremolo bridge. 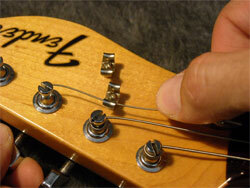 As you play your guitar, the oils and dirt from your fingers ends up on your strings and fretboard. 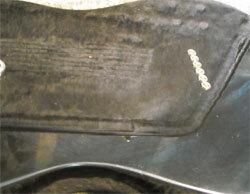 The fretboard itself may get dry over time and will need conditioning to prevent it from cracking. Use a cloth to wipe of any noticeable dirt and dust from the body and fretboard. If there's dirt build up on the edges of your frets, you can use a q-tip to clean it off. Most music stores carry guitar polish and fingerboard oil. Fingerboard oil conditions the fretboard and helps keep it from drying, especially in dry climates. 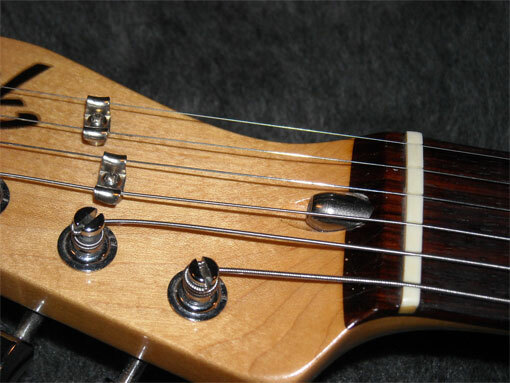 Use a little fingerboard oil on the neck and rub the oil into each fret with your fingers. Let the oil sit for a couple minutes and then you can wipe off any excess oil. When you pick out your new set of strings try to stay with the same brand and type strings or the same gauge strings as you were previously using on your guitar. 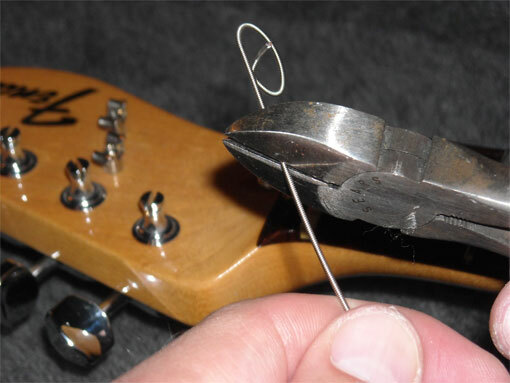 Sometimes a heavier or even lighter gauge set will cause your intonation to be off. Remove the low E string from its package and unwind it. Insert the end without the ball through the back of the guitar into the correct ferrule (the holes located on the back of the guitar's body). Flip the guitar over and feed the rest of the string through the guitar. 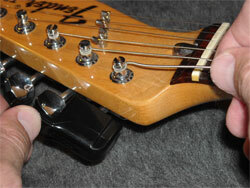 Fender Stratocaster® style guitars usually have a tremolo bridge. 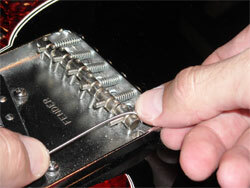 The strings are inserted through the back of the guitar through the tremolo bridge. Remove the face plate on the back of the guitar if you have trouble lining up the strings with the holes of the bridge. 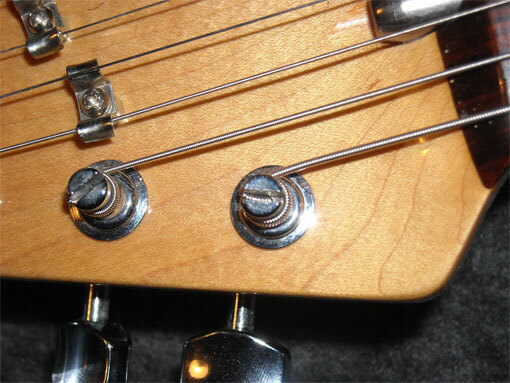 On most Fender® and similar style guitars the tuning pegs have a hole in the center for the string to be inserted into. The string will need to be cut before inserting it into the tuning peg. Hold the string in place and slightly tight to the neck. 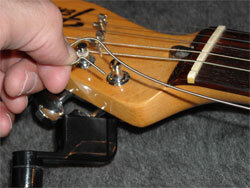 Cut the string about 2-3 tuning pegs from the tuning peg for the string you're putting on. This will give the string enough length to be wound aroung the tuning peg. Insert the cut string into the hole in the center of the tuning peg and bend the string at a 90 degree angle in the tuning peg. 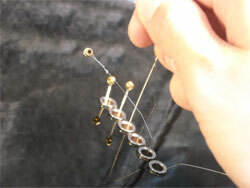 Begin winding the string so the string wraps around the tuning peg counter-clockwise. Make sure the string is on the bridge saddle correctly, and wind the string so there's still a little slack. Repeat the steps for each string. 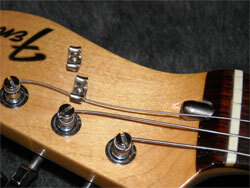 Fender® style guitars also use string trees or string retainers. Hold the string under the string tree as you wind the string. Tune up the guitar. New strings will adjust and settle more after you tune up and start playing. Stretch the strings by gently pulling them upward from the fretboard and pushing the string down at different frets with your other hand.